We are the biggest car rental company in the world. We only promote from within and generally this is different from other businesses. All of our directors and senior management started at the junior level. We recruit about 200 interns and approximately 650-700 graduates a year across the UK. We’re growing massively in Europe. We are committed to diversity, which is driven from the top and not a tick box exercise. This is built into everything that we do and is completely ingrained in our values as a company. A lot of Alliance universities get ignored by graduate recruiters but we know that top talent go to all universities. We also like to put back into the community. Kingston University has a very diverse student population and a diverse workforce is a better workforce. We have a great relationship with the whole of the university. They get it. For example, they know that not all students go through the careers service so they have opened up doors to employers with different departments, with academics, to encourage them to get employability into the curriculum. At other universities this can be a bit of a challenge. Kingston University has given us really good brand exposure on campus. The University team has been to our assessment centres so they understand what we look for in candidates. This means they can go out and talent spot for us, to find us the best candidates. We met with the business school on international operations/ management and were able to go in and supplement one of the lectures to give real world insight into the application of the theory they are learning. We are involved in so much more than helping to write a CV or being successful at interview, Kingston is really trying to embed us in the university. If you’re working with universities, you’re able to have conversations with the people who might be coming into our business. We’re not just advertising on a jobs board. If people are coming into the business being more educated about the company, they understand the business better and are able to hit the ground running. Our retention of employees will be better and will ultimately ensure better performance of the business. It’s a no-brainer. 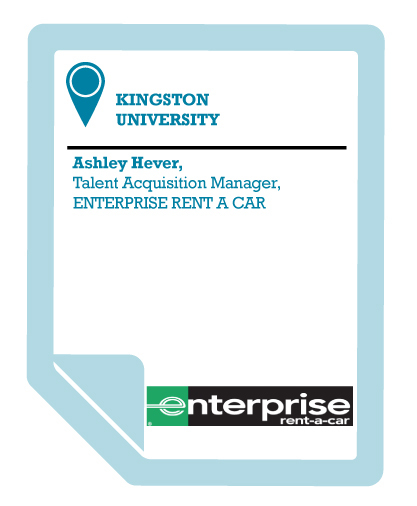 If another employer asked me about working with Kingston University I’d say, why wouldn’t you? You need to recruit people on your own doorstep, you’ve got great students going there, they’re engaged, the employability culture is embedded within the university, you’re going to get as good a student come from Kingston as elsewhere. If you don’t go and try it, you’re missing out. Students from Alliance universities are really driven, they are really committed and they know that they are probably more focused on a whole university experience, having part time jobs, doing internships because that’s what they know they need to do to stand out from the crowd.